California is on track to meet an ambitious goal of putting solar panels on up to 3 million Golden State homes by 2016, according to a new report by an environmental group. The $3.3-billion initiative, which provides subsidies to homeowners, has spurred the installation of 800 megawatts of rooftop panels over the last five years. That's the energy equivalent of two gas-burning power plants. 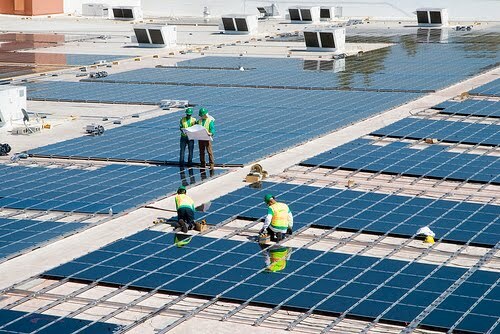 With the prices of photovoltaic panels plummeting, California's installations are expected to triple over the next five years, helping the state reach its goal of 3,000 megawatts of rooftop solar by 2016. "California has only barely tapped into the massive potential of solar power," said Michelle Kinman, spokeswoman for Environment California, which prepared the study. California is far and away the nation's No. 1 solar state, with nearly 1,000 megawatts of rooftop panels installed and about a dozen utility-scale solar plants in the construction pipeline. Solar backers said that rapid growth should continue as California utilities comply with a state law requiring a third of the state's electricity come from renewable sources by 2020. By 2030, solar is projected to account for 16% to 18% of the state's electricity consumption, according to the California Energy Commission. But a separate study also released Wednesday by researchers from the Communications Institute, a Los Angeles think tank, gives a much more cautious view of California's solar prospects. The state's solar production would increase nearly ninefold in the next quarter-century. But that gain would do little to reduce the state's dependence on fossil fuels because of higher energy consumption brought about by a growing population and expanding economy. The upshot: Solar power would fill less than 1% of the state's electrical demand in 2035. "We see significant growth in energy demand that is otherwise unmet by growth in renewables to bridge the gap," said Craig Smith, a physicist at the Naval Postgraduate School in Monterey and a co-author of the report, "Powering California: Assessing California's Energy Future." Other energy experts questioned Environment California's findings. "I'm still skeptical of rooftop, residential solar," said Severin Borenstein, director of the UC Energy Institute and a professor at the Haas School of Business at UC Berkeley. "Eight hundred megawatts is a lot, but we paid a lot of money for them. I don't think it's a good use of renewable funding." Renewable energy is under political siege by Republicans in Congress, many of whom favor expanding domestic drilling for oil and natural gas. The scrutiny has been fueled by the recent bankruptcy ofSolyndra Inc. The Fremont, Calif., solar panel makers had been a favorite of the Obama administration, which gave it a $535-million loan guarantee. Analysts blamed the company's failure on its costly panels that couldn't compete with cheaper Chinese imports, a development that was tough on Solyndra but could prove beneficial for the industry. That's because rapidly falling panel prices have helped push expansion of rooftop solar, making it economically viable for more homeowners and businesses, the Environment California report said. The price of residential solar systems declined to $7.60 per watt in August of this year from $10 per watt in 2007, a nearly 25% drop. Terry Tamminen, the former secretary of the California Environmental Protection Agency, said California's renewables push is good for the environment and the economy, because oil and gas reserves will ultimately dwindle. "It's a fool's paradise," he said of calls to abandon renewables in favor of aggressive development of fossil fuels. But failing to exploit California's oil and natural gas reserves could be costly, said Timothy Considine, a University of Wyoming economist who also prepared an economic analysis for the Powering California conference Thursday. Developing domestic oil and natural gas supplies would create tens of thousands of jobs and billions of dollars in tax revenue, Considine said, while renewables would lead to higher energy rates that cost jobs. "Going full-force with renewables may impose risks on the economy as you pay higher costs," Considine said.